When the wedding party is up for running down the streets of Toledo, they are people you want to party with! Emma is rocking her Mikaella bridal gown through the streets of downtown Toledo. 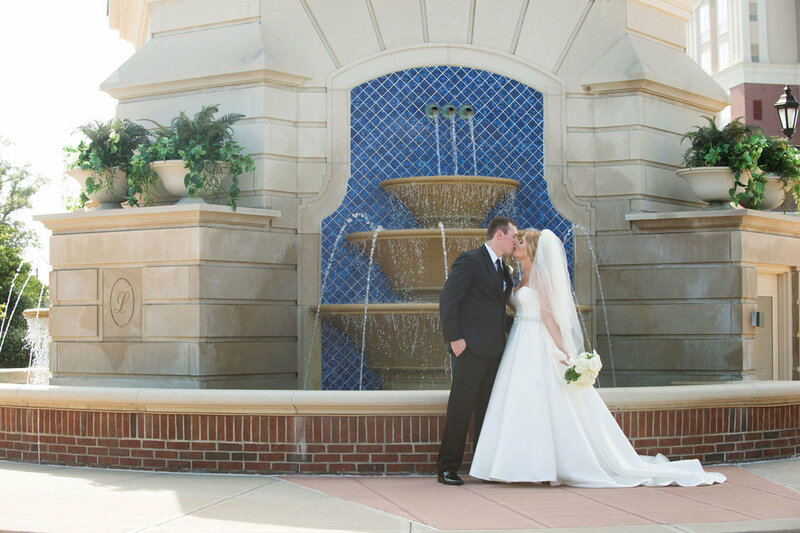 Set at the Toledo Zoo, this couple promised their love and devotion in the formal gardens. If you are dreaming of a rustic wedding, The Stables is the perfect venue. A classic tented wedding reception with twinkling lights and chandeliers have us wanting to dance the night away. Intimate weddings are so worth it! This couple celebrated with 65 of their closest family and friends. Black bridesmaid dresses, a venue full of charm and history, and a dynamic duo are just a few of our favorite things about this wedding. This bride made sure that florals took center stage for their wedding day. Rain on your wedding day signifies that your marriage will last. We say let it rain! This wedding is rocking with sophistication and style. There’s something magical about saying I do by the water. We love a vintage bohemian style and this wedding has it all. 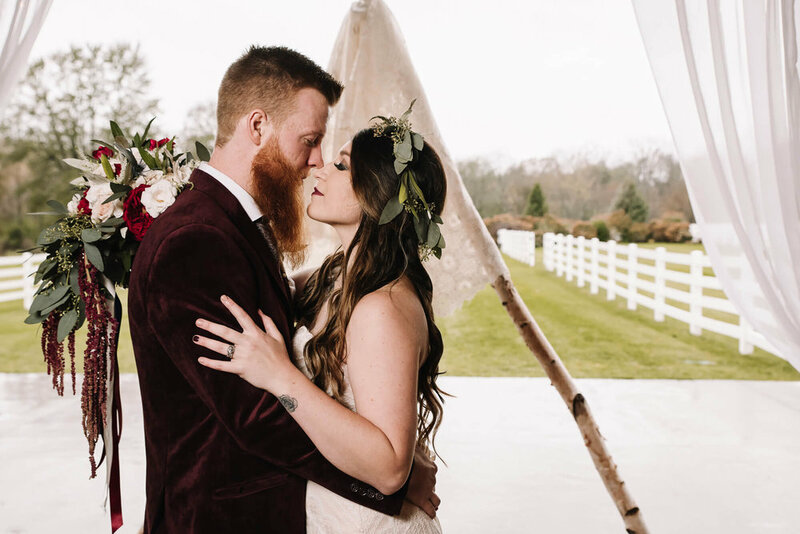 From their burgundy velvet jackets to the vintage china plates and the custom built teepee this couple did not disappoint. This wedding has stolen our hearts but their wedding proposal is truly magical. Trust us you'll want to read on. From Jenna’s leather lace wedding gown, to the rustic farm tables, vintage china, and blushing garden roses no detail was missed for this rustic, chic wedding hosted at The Stables. This bride is stunning in her lace, fitted Justin Alexander dress from Belle Amour Bridal. When rain is in the forecast you move to Plan B - capturing stunning portraits inside The Renaissance Hotel that never seems to disappoint. When the bride’s family is in the floral business you know the blooms will be stunning. This couple’s sweet ceremony will touch your heart. 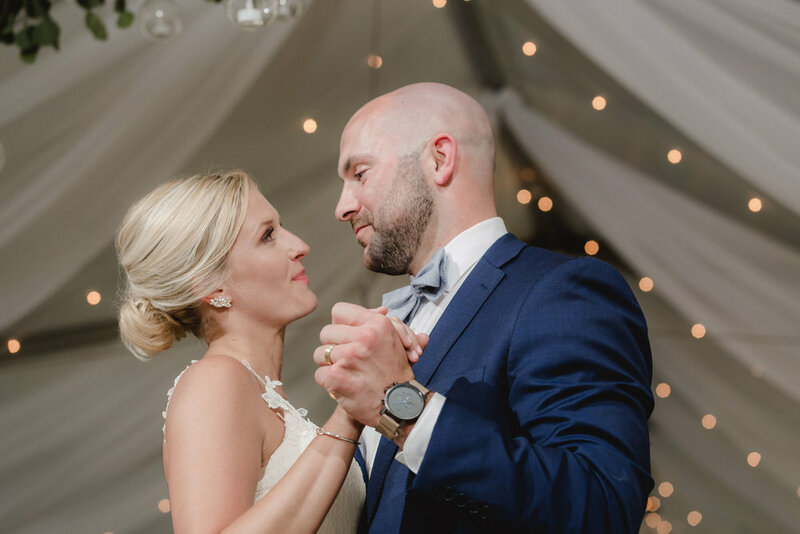 This couple’s love for downtown Toledo, great eats and baseball lead them to the perfect setting to celebrate, The Armory at Hensville. A gorgeous alter with cascading greenery and a dramatic aisle was the perfect setting for this couple to say their I do’s. This bride will sweep you off your feet. Yes, the heat index was over 100 on this day but that’s not the only thing that was steamy about this wedding. This downtown Toledo wedding brings romantic garden vibes to the industrial loft backdrop at The Armory in Hensville. Romance and elegance are the words to describe Taylor and Jared’s day. This glamorous black + white celebration at Toledo Country Club was anything less than spectacular. Samantha was stunning in her Justin Alexander gown and can we talk about her heels? It took meeting 1000 miles away from their hometowns to first become friends and finally husband and wife. Gray skies couldn't keep these two from saying their I do's overlooking the Maumee River. Dana and Aaron's fall rustic outdoor wedding was a picture perfect setting. We promise this is one you don't want to miss. One of the most exciting shots from a wedding is the ceremony send-off. This one was complete with ribbon wands as guests celebrated this sweet couple. This couple wanted a simple, fun and inviting wedding... we agree, they nailed it! The way this groom looks at his bride makes our hearts go pitter patter. 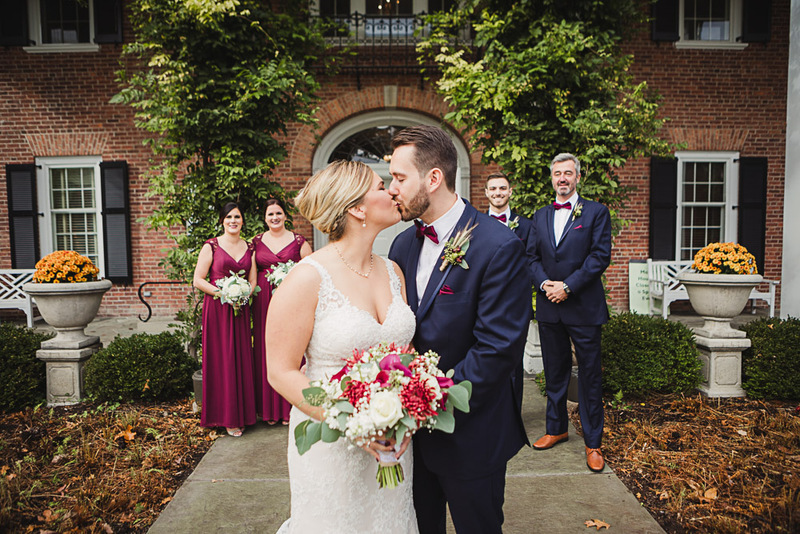 Surrounded by their closest friends and family Lauren and Neil said their I do's at the stunning, historic Toledo Club. Brooke and Josh's day was full of emotion, tears, smiles and endless love as they promised their hearts to each other. This sweet and elegant wedding in downtown Toledo features a beautiful marriage braid ceremony. Simplicity never looked so good! Yes, summer might be right around the corner, but we are loving this fall wedding in downtown Toledo. Yes! This stationer knows how to detail a wedding from her dress, to the ceremony backdrop, not to mention the signage for her boho-inspired wedding. Blooming florals, geometric shapes, dancing + endless love... does it get any better? Can we stop for a moment and take in this luxurious tented wedding at Hensville on the Green? Emily and Eric's pretty pink spring wedding at Carranor Polo and Hunt Club is perfect for the season mixed with light blue accents. Combining traditional elegance with 2018's color of the year, this Toledo wedding includes bridesmaids in purple and dreamy bouquets. We always swoon over a bride wearing a Hayley Paige dress, and this one does not disappoint! This romantic Toledo wedding combines soft pink and blue florals, a stunning ceremony setting and one gorgeous couple. This couple's fun and colorful wedding is one to remember. From the personal touches to the embroidered wedding dress to the lush tropical flowers and the three wedding cakes made by the bride herself. This wedding is fun + edgy with a whole lot of LOVE. An enchanted wedding under a canopy of tall pine trees full of greenery, succulents, flowers and glowing candles is purely mystical. We're a sucker for first looks, especially at unique locations, the headquarters for O-I. This is a wedding I think we all wish we could have been a guest at. The bride's accessories, her dress, those flowers are just dreamy. A classic black and ivory wedding at the beautiful Nazareth Hall will never, ever go out of style. We are heading up north for this perfect fall barn wedding at Hilltop Manor Inn. Take a peek at their rustic chic wedding featuring a handmade wooden arbor made by the bride's father! There is nothing more romantic than being married in the grotto at Nazareth Hall. And this long-awaited wedding celebration was definitely a family affair. The bride's family horse farm was the perfect setting for this couple's outdoor wedding. The bride and groom made sure their guests had a fun-filled evening with dancing, yard games, and fireworks. This bridal party's killer looks is all that needs to be said! When the bride is the executive director of The Hancock Historical Museum, you know she will bring in her love for antique and vintage pieces. You don't want to miss the seating vignettes for guests to enjoy during their summer wedding. Amanda and Matt's intimate wedding was top notch from the dress to the florals to the pizza food truck! Take a peek at the gorgeous photos captured by Love Is Greater Photography. Who doesn't love an outdoor ceremony featuring a romantic, draped cloth arch? This couple didn't miss a detail from their wedding cake to the popcorn and donut bar to the bride's sparkly shoes. A picture perfect day in July with beautiful blooms, gorgeous cake, stunning ceremony and a cute couple. We've got it all right here! If you have your heart set on a classy, beautiful wedding, Inverness Club is the perfect place to host your reception. And this couple didn't miss a detail on their wedding day. The story of how they met, fell in love, and their proposal will bring a tear to your eye. Visit their wedding day at Registry Bistro and see how it was a true celebration of their love. We love outdoor ceremony and receptions, and this sweet, vintage wedding will capture your heart. We invite you to take a look at Kristina + Doug's summer wedding. If you've never been inside The Valentine Theater to see all it's charm, here's your chance to see this classic, beautiful wedding captured by Adore Wedding Photography. From the cake smash, to the groom's 'Top Gun' inspired garter removal and a sparkler send-off, we invite you into this couple's perfect day. Life is salty, but love is sweet and this bride and groom's love is definitely sweet. Take a peak at their perfect day in downtown Toledo. The bride wanted a timeless autumn wedding and we think she captured the perfect vintage chic and rustic day. We invite you to take a look into their wedding day. A local news anchor ties the knot in Maumee, Ohio with a simple, classy wedding held in June. Great Expectations meets Great Gatsby wedding inspiration at the Toledo Country Club. From the greenery to the twinkling lights, you’ll fall in LOVE with this summer wedding. Carranor Hunt and Polo Club is a hidden gem in Perrysburg, Ohio and was the reception venue for Jennifer and Brian's September wedding. We love her bouquet with touches of succulents and their baby basil favors. The bride's favorite movie was the inspiration for their under-the-sea nuptials. Take a peek at this couple's romantic day. Love is sweet... especially when guests can pick sweet treats from 5 different local Toledo bakeries. Visit Kate + Jesse's I dos at Carranor Polo Club in Perrysburg, Ohio. An intimate wedding reception in the charming town of Monclova, together with floral ties, a flower crown and an ombre color scheme for this dreamy wedding. In front of their closest family and friends, these two said "I do" at Registry Bistro in the Secor Ballroom. The decor and lighting designed by La Boutique Nostalgie and Mager Designs completed their 1930's inspired wedding. Swatch Studios captured this bride and groom's industrial + emerald inspired wedding - with a nod to their favorite band. Take a peek at this downtown Toledo wedding. This country club wedding celebrating with the soft tones of the season and spring florals is a must see. And what better way to end the night than with a sparkler send-off. Long distance wasn’t going to keep these two away from true love. This classic wedding reception designed in metallics was held at the Toledo Country Club with a breathtaking ceremony overlooking the Maumee River. Two high school sweethearts + Catawba Island equals one breathtaking background. And who doesn't love a man in Dress Blues. One look at how these two look at one another, you can feel the genuine, sweet love they share for each other. The couple say their I do's in Lauren's home town of Toledo. 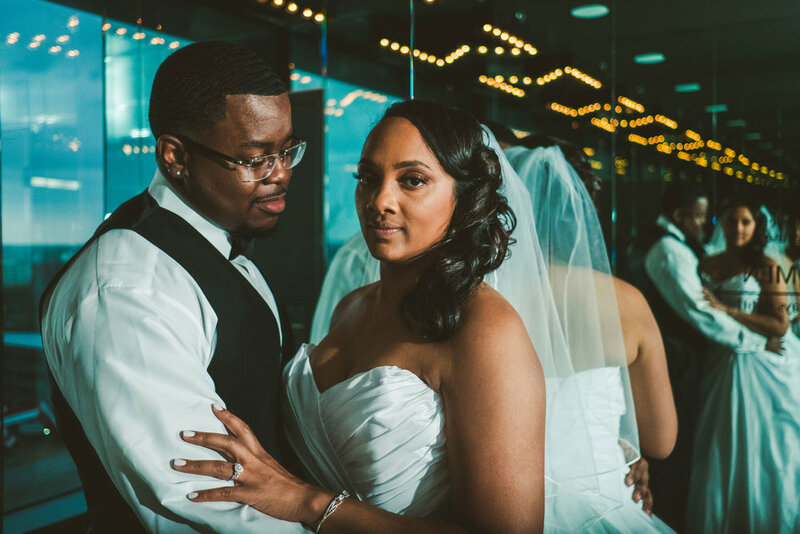 This intimate, Wednesday wedding in Toledo, Ohio will pull at your heart as you watch two families become one. Aislinn and Andy’s I dos prove simplicity can also be completely stunning. When the bride is a creative designer and calligrapher you know this wedding won't disappoint. This colorful wedding hosted at her childhood home in Oregon is a must see. When you know, you know. And Lindsey + Andrew knew the moment they met. Take a look inside their glam wedding. Once Eryanne had her eyes set on Keegan, she wasn't about to let go. We fell in love with this vintage, rustic inspired wedding held at the historic Oliver House. If you love the history of downtown Toledo and baseball - let's be honest, who doesn't? Then Marie + DJ's wedding might be perfect for you. A country club wedding filled with an oasis of greenery, plus classic black and white for a timeless, romantic celebration.